Ever had a problem with your water supply? This week, my city has a problem. The water pipes supplying some of the outlying villages have decayed and started releasing something toxic into the water. No-one is sure where the problem is exactly, or how long it will take to fix, but you really don’t want to drink that water until they have! So God has been speaking to me this week about the importance of keeping the supply pure, because the fountain of water that he has placed in each of us that chooses to follow him is not just for ourselves but also for all those around us. Have you ever drunk water through an old plastic bottle spout, or (if you’re really lucky) through your own sock at at youth event? If you have, you’ll know that water inevitably tastes of whatever it has passed through. 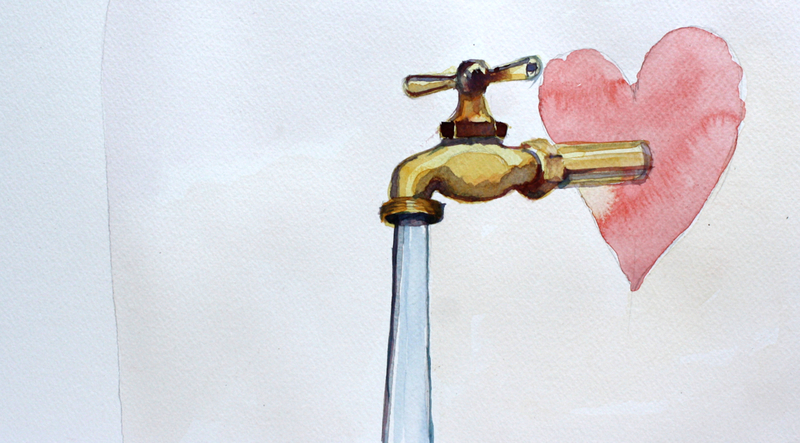 And whatever living water you give out to others will pass through your heart on its way. I’m feeling challenged this week because our dodgy water supply has reminded me that any bitterness, unforgiveness, cynicism or hatred in my heart will pollute the water that flows out me in my friendships, my relationships and ministry. And if I don’t want to have these things in my heart slowly leaching toxic waste into the people around me then I need to do something about them. All you amazing, extraordinary, wonderful fountains of living water reading this post, it’s time for us to get cleaned up – there’s a world full of thirsty people out there and it’s time to get them a drink. Thank you Ellie. Another beautiful picture – clear, concise, meaningful & very helpful. This really spoke to me. Bless you for continuing to bless us with your insights my friend. Keep going! I won’t forget the drinking through a sock image! So true I desire to be that fountain to all those who are in need of a long drink of his living water, and your gentle nudge gets me to make sure my supply is clean and fresh for myself and others to drink deeply .